The cooler months are all about layering and keeping toasty. Whenever I can, I actually prefer to wear as few layers as possible. 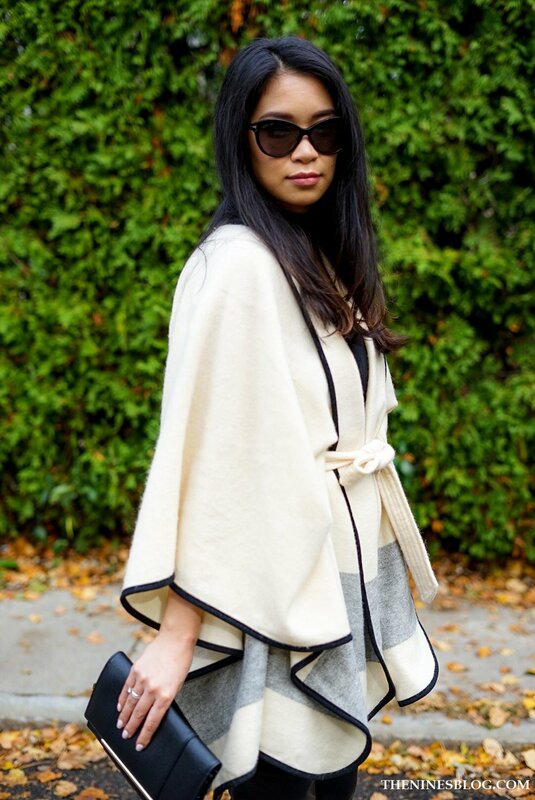 One of my favorite styles during time of year is a cape-kimono. My favorite is this one (below). I pull this out at least a couple times during the fall and if luck will have it, once on a warm winter's day. To make this possible, I wear thermals underneath. I love the how the neutral colors come together with the lines on this cape-kimono to create a drapey, effortless feel. It can look quite voluminous on top so it's importance to create balance. I do this by adding height with black leather over-the-knee boots and showing a bit of skin with a mock-neck body suit underneath. This outfit is all about the cape-kimono so I keep accessories to a minimum. A simple black clutch, chain bracelet, and black sunglasses. Some of my friends shy aware from capes and ponchos; they've said that it ages the wearer. In some instances, I can see where they're coming from. However, I wouldn't avoid this style completely. Look for pieces that have long lines, and simple patterns. It can actually look quite chic! What do you think about this look? Do you have a preferred place to shop for capes? Let me know in the comments.